Recording Inspection Data is a key element in understanding the current state of the physical asset. These inspections typically represent themselves in Non-Destructive Examinations (NDE) defined in API 510 (Pressure Vessel Inspection), API 570 (Pipe Inspection), API 653 (Storage Tank Inspection), and other standards globally within the oil and gas and chemical industries. The information collected is critical in understanding the deterioration mechanisms, such as Corrosion Under Insulation (CUI), Thinning and Brittle Fracture, but are also used to confirm fit-for-purpose readiness of the asset throughout the asset life-cycle. Operators and contractors predominantly utilize a paper-based approach for collecting and distributing inspection reports. This ensures key data is kept in non-structured formats, either in a PDF file on a file server, or within a hard copy filing system. Either approach makes the data hard to search for anomalies and recommendations identified in the inspection report. Where an Inspection Data Management System (IDMS) is utilized, there is often a data clerk who will transcribe the paper inspection into the IDMS, causing inefficiencies and often data transcription errors. And finally, accessibility of inspection software is a challenge most operators face. As 3rd party inspectors perform work, there are barriers for accessibility to the corporate systems (File Server, Document Management Server, or IDMS). These barriers cause an IT headache in providing temporary access for digital report delivery, often creating a large backlog of paper inspection reports. We live in the “App” economy where easy access to inspection software should be available for a mobile platform. Inspection professionals should demand an easy to use and accessible app to address a paperless inspection. AsInt, Inc. has solved this problem by offering the first Inspection App, free for download, optimized for the Oil and Gas and Chemical industries. 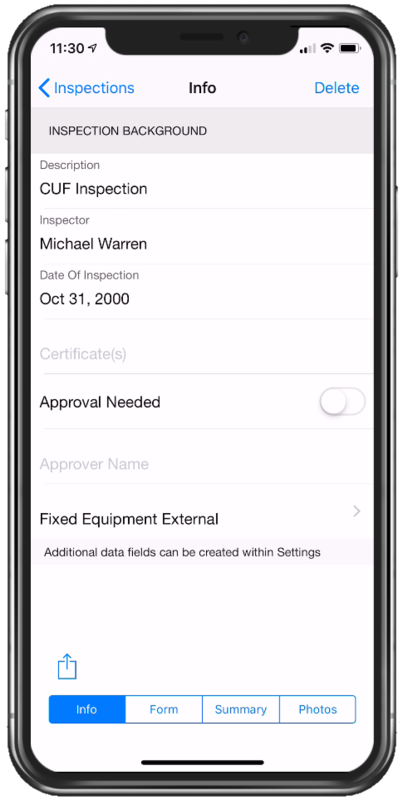 The CORE Inspection App is free to download and ships with a standard set of Checklists for inspections. Users can create new templates that consist checklists, findings, priorities, and recommendations, or just perform traditional readings against locations. The CORE Inspection App is accessible via the Mobile Appstores and has the ability to re-point the App to your backend IDMS solution. Addressing the accessibility of the software for 3rd party inspectors. AsInt CORE Inspection for SAP (IDMS) - Optional for Mechanical Integrity Inspections and Thickness Data Management in your SAP solution. Optional is your corporate Inspection Data Management System (IDMS) - AsInt can configure our App to persist data for an additional service. Most operators have a defined digital transformation strategy and therefore have recognized the need for a paperless inspection process. Manpower reduction and decreased data entry errors are value added, however the ability to understand in realtime the condition of your assets is the true value to avoid failures. By understanding and managing recommendations by qualified inspectors in a closed loop plan, do, check, act process is key to identifying critical actions for mitigation.